Existing since 1985, Anode, LLC. is a full service, custom metal finishing company with years of custom aluminum anodizing, chromate conversion, and powder coating. We are highly dedicated to meeting our customers' metal finishing and aluminum anodizing needs. 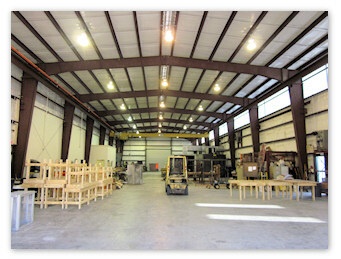 Our facility is 20,000 sq. feet and contains sophisticated equipment of handling larger parts as well as a large volume. For your anodizing needs our tanks are 21' X 4' and for you powder coating needs our curing ovens are 24' X 8' X 8'. We can handle large jobs as well as small. We are highly dedicated to meeting our customers' needs. Give us a call today and let us quote you on your next metal finishing order! Anode, LLC., specializing in powder coating and anodizing services in New Orleans and the surrounding areas including Slidell, Covington, Mandeville, and the Mississippi Gulf Coast. ©Copyright 1996-2019, Anode, Inc. All rights reserved. Information subject to change without notice.